A degree in English literature and a fascination with Jane Austen is a fun college major but doesn’t provide many options in the career field so Kate Sharp is fortunate to have found a job as a location scout for Hollywood movies. As a new film adaptation for Pride and Prejudice is ready to go into production, Kate’s boss Kevin travels to Nether Woodsmoor, a quaint village in England, that will hopefully provide locations perfect for the new film. The cut-throat business of scouting requires them to be thorough, efficient, and fast. But when Kevin fails to return after his scouting trip, Kate and office manager, Marci, become concerned that Kevin might have slipped back into his old addiction. Knowing how lucrative the job is and with the production company calling regularly for updates, Kate travels to England in hopes of finding her wayward boss and keeping the profitable account. Kate arrives to find Kevin’s luggage and laptop but no camera, and no Kevin. Kate begins to travel through local pubs and stately country manors trying to retrace Kevin’s steps and find her elusive boss before the film’s pre-production crew bails on their company and Premier Locations goes out of business. I’m always a bit skeptical of the Amazon “if you like this, then you might also like this,” but this particular series has popped up numerous times so I thought I would give it a try. Of course, set in the idyllic English countryside and featuring a Jane Austen aficionado, the book wasn’t too much of a stretch! I liked it! It was a quick read that definitely falls into the cozy mystery category but it was fun with engaging characters, beautiful setting, and well-plotted story-line. Kate is a very likable character and her quest to find her boss is logical and driven by an altruistic purpose. If you like cozy mysteries, check this book out. It looks like there are three more in the series plus a holiday novella. I will be checking out more of these in the future! 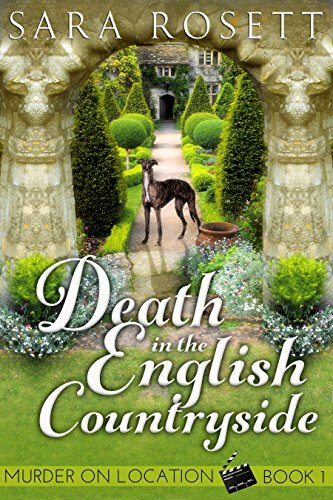 This entry was posted in Book Series and tagged Death in the English Countryside, Jane Austen, location scout, Murder on Location, Pride and Prejudice, Sara Rosett on November 10, 2016 by kvgaughan. Queries and Conundrums: Readers Live Longer!